The biggest tease of all, by far, though, is the peonies. They have had visible buds swelling on them for some time now. But it'll be weeks before I actually see any blossoms It's incredible to me how long they take! I used to watch them so closely, thinking, "any day, any day," but now I know it's going to be awhile yet. But with all this pretty sunshiney weather, maybe it won't be as long as usual! The daffodils (Narcissus) are blooming merrily, though. I don't have a lot in this garden yet. I have been waiting to plant them until the garden is "done" and I won't have to worry about working around them. I should probably go ahead and plant some, though, or I'll never have more! I love the little periwinkle flowers of the Vinca minor. 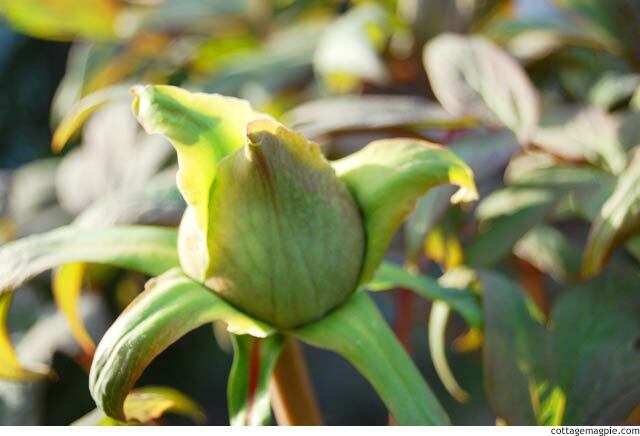 Here's the teeny-bud on one of the herbacious peonies that teases me so. That is the enormous bud on a tree peony (Paeonia suffruticosa)!!! 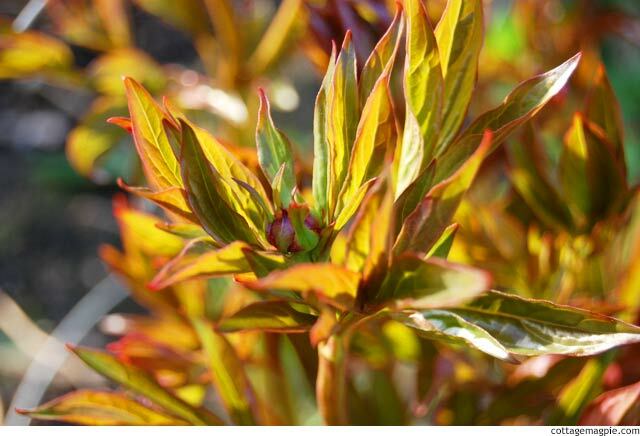 I bought my tree peony a good 10 years ago. It was insanely expensive. Fifty (yes, fifty) dollars for a little 10" tall stick. A stick! Of course, you know they don't like to be moved, and I moved mine at least a dozen times while I still lived at the other house. And then I moved it here when we moved here, and it was planted in a pot for awhile, then out front for awhile, and then finally, finally, put it in the spot it's in now when I put the herb bed in a few years ago. In all that time, it has (understandably) not bloomed. Some years it's looked so pathetic, this stick with maybe one leaf on it, that I've thought I should just give up and toss it. Well, good thing I didn't, because look at it now! Those buds don't seem like it, but they are HUGE, like 2 inches across! I can't wait to see what they look like when they finally bloom. 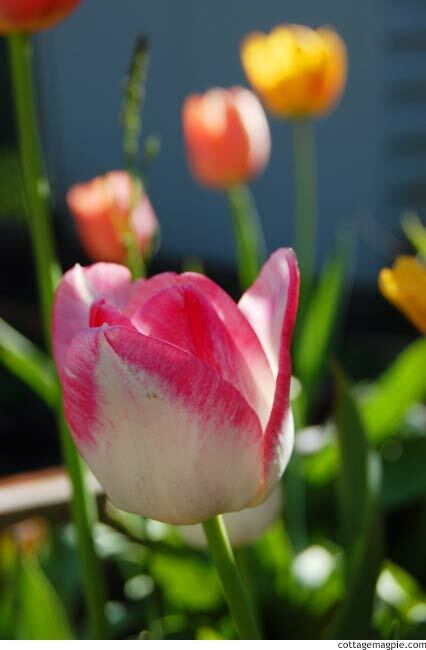 But of course, we can't forget one of my favorite Spring flowers, the tulip!! 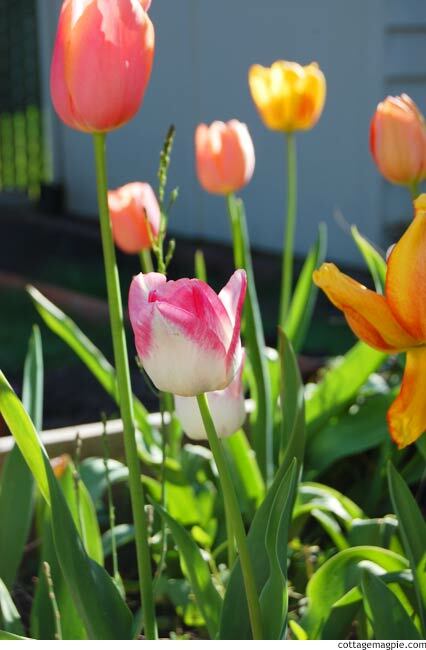 I have this planting box in the backyard (in the middle of the Shed Garden project), that definitely needs to go, and I've been trying to move the tulips out of it for ages, but this year it exploded in this pretty festival of peach, pink and yellow. One of my favorite color combinations!!! I had gotten a mixed bag because they were inexpensive, and had no idea these were all still in there. Lucky me.